PNC Park in Pittsburgh, Pennsylvania, the fifth home of the Major League Baseball franchise, the Pittsburgh Pirates, as featured in photos has modern-day amenities with old-time character. PNC Park has a natural grass playing field, two-tiered seating, wide open views, and luxury boxes. The park opened in the 2001 baseball season in an aesthetic "classic stadium" style, a throwback to the early days of baseball. Three Rivers Stadium, the former home of the Pirates for 30 years since 1970, had been designed for functionality and was demolished by a controlled implosion in 2001. A fitting homage to the Pittsburgh Pirates, upon its opening, PNC Park was considered by ESPN and the sports world to be among one of the best ballparks in baseball. Offering scenic views of the downtown Pittsburgh skyline and riverfront, PNC Park takes full advantage of its stunning location along the shore of the Allegheny River. 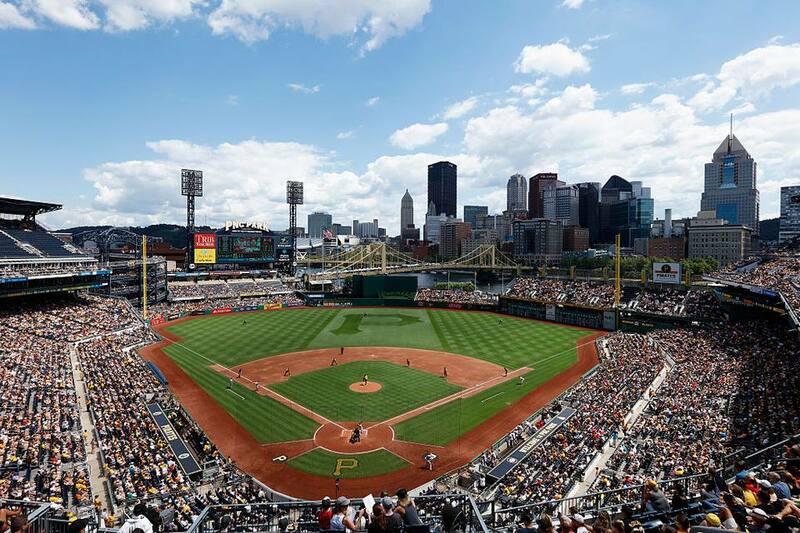 It is a true neighborhood ballpark in the heart of downtown Pittsburgh with easy access by car and riverboat, as well as on foot via the riverwalk or from downtown across the Roberto Clemente bridge, which is closed off to vehicular traffic on game days. For baseball fans, PNC Park abounds in history, with statues of legendary Hall of Fame Pirates' players Honus Wagner, Roberto Clemente, Willie Stargell, and Bill Mazeroski guarding the perimeter. The home plate and left field rotundas offer continuous ramps from street level up to each seating levels that feature historical highlights along your ascent or descent. The luxury suites at PNC Park are named after legendary seasons in Pirates history. The city of Pittsburgh formed part of the inspiration for the construction of the park, which is made of native materials, such as rugged limestone and exposed blue steel, honoring Pittsburgh's strong steel heritage. Because of its intimate design, the highest seat in PNC Park is just 88 feet from the field, giving every fan in the park an ideal sight line. The outfield wall at PNC Park rises up to 21 feet behind right field. That number was chosen in honor of Pirates legendary right fielder No. 21, Roberto Clemente, and drops down to just six feet in front of the left field bleachers. Every game brings boaters out onto the Allegheny River hoping to retrieve a ball. It is 443 feet from home plate to the Allegheny River. One of the smallest ballparks in Major League Baseball, PNC Park has 38,127 seats on two levels. The park offers intimate views of the field. Seats behind home plate are only 50 feet from the batter's box, while seats down the baselines are only 45 feet from 1st and 3rd bases. There are 540 field club seats behind home plate and between the dugouts with access to a private lounge. Luxury suites are wedged between the lower and upper decks. This seat design means that fans can walk around the entire main concourse of PNC Park without losing sight of the field. In the outfield, you can sit in the section of bleachers in left field for close views of the field, or sit in right field and try to catch a home run ball if it does not make it to the river. Or, you can overlook the bullpens and catch an excellent view of the field from left centerfield. PNC is also one of the few ballparks in the country that lets you bring in outside food and water. The rules stipulate no beverages outside of water, which must be sealed and in plastic containers. PNC Park concession areas offer a wide variety of local favorites alongside more traditional ballpark fare. You can find peanuts, hot dogs, and Cracker Jacks. But, you can also enjoy pierogies, kielbasa, local pizza, barbecue, gyros, grilled items, tacos, and seafood. Prices for specialty food can sometimes be a bit high, but the basics, like hot dogs, drinks, popcorn, and beer are more affordable. Kids can take a break from the baseball action at the Kids Zone located at the right field gate. The Kids Zone features a miniature PNC Park configuration as well as a multi-purpose playset. Children ages 5 to 10 are permitted and must be accompanied by an adult. During inclement weather, the park may close the playground for safety reasons. Following select Sunday games, kids age 14 and under can head to the field for Kids Run the Bases. The line begins forming in the 8th inning on the right field Riverwalk. The Pirates may cancel Kids Run The Bases in the event of inclement weather or for other safety reasons. If you're looking for inexpensive tickets, PNC Park has 6,500 reduced price seats. You can buy tickets online, charge by phone, or at the ticket office at PNC Park. The Pittsburgh Pirates also cater to season ticket holders and offer a variety of season ticket packages, including full season, partial plans, and shares. The gates at PNC Park usually open one and a half hours prior to game time on weekdays (Monday through Friday) and two hours prior to weekend game times (Saturday and Sunday) and on opening night. The Riverwalk between PNC Park and the river opens a half-hour prior to the gates. If you are coming from the North, then your best bet is usually to park in one of the north shore surface lots or garages around PNC Park. This will provide easier access back to I-279 North, Route 65, or Route 28 after the game. North shore parking choices include the North Shore Garage, the Allegheny Center garage, surface parking lots on River Road, and other surface lots near PNC Park. If you are coming to Pittsburgh from any direction but North, it is usually easier to park downtown. From downtown Pittsburgh, it is only a 5-minute walk across the Roberto Clemente Bridge (closed to vehicular traffic on game days) to PNC Park. There are dozens of downtown garages that offer inexpensive flat-rate parking for Pirates games, and the "T," Pittsburgh's metropolitan light rail, offers free rides between downtown locations (the Wood Street Station is closest to the Roberto Clemente Bridge) and the north shore. When parking is tight—especially for lunchtime, mid-week games, or weekend games when the Penguins and Steelers are also at home—you have a few other options. You can try parking at the Station Square shopping mall and take a Gateway Clipper riverboat shuttle to PNC Park. There are several riverboat game day packages. You can park at the Grant Street Transporation Center, Pittsburgh's main bus station, which has a 1,000-parking space garage. It is located across the river adjacent to the convention center. Or, you can usually find parking at the PPG Paints Arena then board the T at Steel Plaza for a free ride to PNC Park. The Allegheny County Port Authority operates more than 50 bus routes leading to downtown Pittsburgh from all over the area. You can park in one of the many park-and-ride lots, and usually zip into downtown. From the South Hills area, park at one of the T stations and ride the T downtown to the Wood Street Station for the shortest walk to PNC Park.